When this recording of Mahler�s Fifth, reissued in this set, first came before me for review (Laurel Record LR-905) I ended up writing the most positive review of any release I have ever placed on Music Web. In so doing I contributed to something of a stir beyond its web pages as well. This �stir� is even referred to in the liner notes of this release. I realised then that I was in the presence of one of the finest recordings of a Mahler symphony I had heard in over thirty years and what I considered the finest version of the Fifth then available. As I intend to spend this review considering the brand new recording of the Tenth Symphony that is coupled with this reissue of the Fifth I think it would be best, if you do not already own the recording of the Fifth, for you to read my original review of it safe in the knowledge that I have not changed my mind. I concluded: "If you buy only one new Mahler recording this year make sure it�s this one. Versions of Mahler symphonies of this calibre arrive very seldom. It is the finest recording of the Fifth Symphony currently available." The excellence of that Fifth under Barshai naturally made me anxious to hear more Mahler from him. At that time I knew he had been engaged for some years on his own score realisation of the Tenth Symphony material left by Mahler at his death and that this was likely to be the next Mahler we had from him on record. When it emerged that the recording would be with the same orchestra as that of the Fifth my expectations were heightened. It has been a long wait but now the wait is over. I can report straightaway that it has been worth it, both in terms of the score but also, most importantly, in terms of the performance and the recording. This disc of Barshai�s version of the Tenth is more than worthy of being coupled with the Fifth, so much so that if you already own the original release of the latter I would advise you to have no hesitation duplicating it so you can get his Tenth. Perhaps you can gift your old single copy of the Fifth to a music-loving friend and so spread the word of Rudolf Barshai in Mahler farther and wider. Mahler left the Tenth complete on four staves. We know enough of his working techniques to know that, once he had set down that stage of a work, he never altered the basic structure. He then orchestrated the first movement and, to most intents and purposes, the tiny third movement. Only the beginning of the second movement was orchestrated and then the orchestration runs out. However, through the rest of the four staves there are indications, some more detailed than others, of his thoughts regarding possible orchestration, dynamics and tempi. It's these that have been worked on to arrive at what I think could be reckoned eighty-or-so percent of Mahler's wishes at that time of work in progress by various hands including Deryck Cooke, Joe Wheeler, Clinton Carpenter, Remo Mazzetti and now Rudolf Barshai. The best known of these, Deryck Cooke, always pointed out that Mahler would inevitably have further revised the work and it is in those revisions that Mahler's own refinements would have come in and his unique sound emerged, a unique sound no one else would have got to. So none of these performing versions ever can be called "completions" and it is important to always bear this in mind. The last time I reviewed a recording of Mahler�s Tenth it was Andrew Litton�s Dallas version of the Carpenter score. In the course of what was one of the most negative reviews of anything I have ever written for Music Web I had a number of things to say about how I believe the various and growing number of performing versions of the score should be approached by the listener. So let me direct you to that review and add that I have not had cause to change my mind about this one either. You will gather that even then I was prepared to live with Rudolf Barshai�s version of the score principally on the evidence of his superb conducting of it that I had heard in two radio broadcasts. However, now that I have had the opportunity of listening to Barshai�s approved recording I am in an even better position to report what my feelings regarding the score now are. It is certainly the case that there are some passages in it where I found my eyebrows raised a fraction or two at the conclusions Barshai has reached. However that in no way deters me for saying that here is a presentation of Mahler�s material that, whilst it seems to step somewhat further into creative speculation about Mahler�s ultimate intentions than that by Deryck Cooke, is still a score Mahlerites can accept as a most stimulating, eminently valid and thoroughly professional version. There is a fierce intellectual rigour running through it which overrides any niggling doubts one might have from time to time about passing details. By that I mean the fundamental argument of Mahler�s own is never diffused by tricks or over-scoring. Barshai seems to know unerringly when to stop and leave things alone. He does, however, certainly appear to have an agenda, of which more later, but that is quite acceptable and it is an appropriate agenda anyway. Most important of all here is a score which allows Barshai�s particular talent as a Mahler conductor, as evinced in his recording of the Fifth, to have full rein. That, as I stated in my review of the Litton recording, is what I believe has ultimately to carry all before it, whichever version of the score is being used apart from Carpenter�s. Here, where the version of the score used is uniquely that of the conductor himself, Barshai�s view of the music as a conductor is so intimately welded to his view of the music as an editor that, in the end, I think it becomes difficult to tell where the one starts and the other finishes. The only solution is to put away any thoughts about whether this might or might not be what Mahler actually intended had he lived. You should stand back and take in the piece as a whole, and allow what you hear to convince you � or not, as the case may be. All that being said, Barshai�s score works and works well. There are no great "shocks" in store for those who, like me, have grown up with the Cooke version. In fact I think there are insights which will send you away enriched rather than enraged. I am convinced enough by the Barshai score and by both the intimate combination of that score with the performance given of it to recommend it to you warmly. Some will disagree with me. In the context of this ever-developing acquaintance we are having with Mahler�s Tenth, this is a phenomenon to be welcomed. It stimulates further our interest and concern for Mahler�s life�s work. But what I hope no one will disagree with is the sheer quality of the performance: by Barshai as conductor, and by the players of the Junge Deutsche Philharmonie. So take this recording in its totality - score and performance - and I believe that you will return to it often. The first movement is compelling from start to finish. One of the benefits of a single "live" performance, which this is, is the opportunity for the conductor and players to think in the longest of paragraphs. What most impresses on first hearing is the playing of the strings which are, by turns, searing, searching, warm, ice-cold, ardent, playful, in fact every shade of meaning available to them which Barshai loses no opportunity to apply whenever the music demands. This is not a comfortable view of the movement, though. Barshai�s philosophy behind his edition of the score, the agenda that I referred to earlier, is, I think, very much one of seeing Mahler in the Tenth as precursor of the future in music and there is a concomitant restless quality to his conducting all the way through just as the future in 20th century music became more restless with the century; as good an example of score and performance going hand in hand as you could wish for. From this first movement you can also hear a prodigious care for the inner details of the scoring, especially the woodwinds, and the recorded sound presents us with a rich balance where everything can be heard clearly. This is especially so in the Development section where overtones of "Das Lied Von der Erde" are apparent in those woodwind contributions taking on the chamber-like textures of that earlier work, helped to be heard again by the open quality of the recorded sound. You are aware that Mahler�s powers were still at their height here. The great outburst/crisis in the centre finds the brass section rich, firm and absolutely solid, and the balance from the engineers, for me, well-nigh perfect, making the moment searing in its intensity. The squeal of the solo trumpet is quite the most terrifying I have ever heard on record. By the end of the movement you will again have heard Rudolf Barshai�s particular credentials as a Mahler conductor that appeared so memorably for me in the recording of the Fifth Symphony. An intellectual rigour balanced by an ardency of heart with neither predominating. In the second movement all the textures are again very clear and open, players assisted by engineers, and so too is Barshai�s insistence on that persistent rhythmic "nag" that prevails through so much of the movement. He really does seem to make this rhythmic gait of the main scherzo material a cardinal aspect of what he does here. The trio sections are all upper Austrian gaiety and catch, but I think you will, like me, be surprised at some of the instrumentation Barshai has employed here. I won�t spoil the surprise by telling you what he does. Listen for yourselves and make up your own minds as to whether you think his solution is valid. For the rest, the stops and starts, the jagged quality of the movement�s progress; again that uncomfortable tone noticed in the first movement as an undertone now becomes an overtone. The feeling that there is something nasty hovering over us which we cannot quite see is a growing presence. The tiny third movement Purgatorio finds Barshai and his players in very deliberate mood and tone. Rhythm is again very marked and stressed. There is acknowledgement of the Wunderhorn song with which the movement shares ancestry but Barshai�s main tone of voice is, I think, one of growing bitterness. This is, after all, music that will be recalled in the last movement where the bitter aspect will make its final conflict with the need, on the other hand, for resignation and repose. It is as if Barshai is laying down his marker for that and wanting us to keep it in our minds. The fourth movement, the second scherzo, has Barshai maintaining a superb grip on the disparate elements of this most difficult of Mahler�s movements with the ever- shifting, ever-changing canvas superbly rendered. Listening to this recording I became aware, to an extent I hadn�t previously, that Mahler was here trying to demonstrate that one of life�s truest horrors is the fact that nothing endures, that everything changes, that even what appears to be the most enduring will be undermined by life�s machine grinding us on and grinding us down. Barshai�s performance, and, one must also assume, his score, brings this aspect out in an astounding way. In what is an outstanding interpretation of the whole symphony I think this movement in particular stands out as the most remarkable of all. I have simply never heard it played and interpreted as well as it is here. 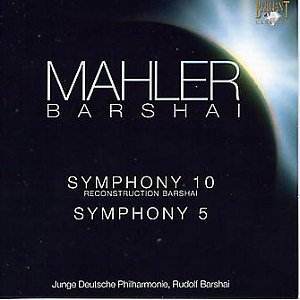 When towards the end the music darkens and heads towards worlds that Mahler had only hitherto hinted at there is confirmation, for me, of what I have suggested is Barshai�s overall view of the Tenth as a forward-looking musical canvas. Schoenberg, Berg and Webern beckon, and so too does Shostakovich and Britten. Not just the sound of what you hear but the meaning beneath the notes. Stunning. The drum strokes that open the last movement are placed quite distantly in the stereo picture. They are still loud enough to chill, though not so loud that they knock you out of your seat. The recording also renders the deep sounds that permeate the opening of the movement very well. Notice especially the softest of bass-drum rolls that is a feature of Barshai�s scoring here. Under him the last movement unfolds as it should: as counterpoise to the first movement. Here, symphonically, all is resolved. Barshai�s grasp of the arching structure is unerring. The driving allegro section after the second appearance of the drum-strokes recalls, for me, the hedonism of parts of the Sixth Symphony�s last movement. The recall of the first movement climax is just as terrifying as it was first time around with the superb sound recording laying bare the levels of this extraordinary music. The close of the symphony, that long, valedictory arrival at repose and resignation that Mahler has been aiming at since the start of the first movement, is more richly scored than we may be used to, but never obtrusively so. Barshai�s balance of head and heart is illustrated yet again in both score and interpretation. You will have gathered that I think very highly of this new recording of the Tenth Symphony. If, like me, you believe it to be the performance that matters most in choosing a recording irrespective of which performing edition of the material is used I have a simple conclusion: that this may well be the finest performance of the Tenth on record and that you can buy it with confidence. If you do take into account performing editions, however, then things are a trifle more complicated. Put it this way: in terms of performing editions alone, I think that anyone who is coming entirely new to the Tenth Symphony should still hear Deryck Cooke�s more austere version first in a good recording and get to know that. There are a number of fine versions available. (Simon Rattle on EMI Classics 5569722, for example). But once that is done Barshai�s new version should be your next port of call where you will be given a subtly different perspective on the material, rather like the effect of a painting you have been used to being hung on one gallery wall now being hung on another with different light sources, background and frame. You will hear a rigorous, professional and consummate score with much to interest, provoke, move and inspire. You will not be without questions, though. You will not be without some surprises. But you will, I think, be impressed and moved. You will also hear in this recording a performance of the work the excellence of which is, in my opinion, not equalled in any of the recordings of the Cooke version and it is this belief which will keep the recording special to me. This single recorded performance took place on September 12th 2001, the day after the tragedies in the United States, and some of the eloquence of what we hear surely must have been due to the players� reactions to that. They play even better than they do in the Fifth with refinement and eloquence and a corporate élan that would be envied by great metropolitan orchestras. They are also served superbly by the engineers with sound of clarity and power but with a realistic concert perspective. All this from a bargain label only makes it more remarkable and Brilliant Classics should be proud of themselves for issuing this. The best Mahler Fifth on record is now coupled with a Tenth to treasure. Barshai�s Mahler is not to be missed.